Screenshot of MakaiPlanPro illustrating the use of the MakaiDTM module whereby raw survey point data was transformed into georeferenced color shaded relief maps. Windows XP/7/8 supported and full compatibility with earlier versions of MakaiPlan Pro. New MakaiDTM module (add-on) includes an easy-to-use wizard transforming your raw survey point data into grid data and georeferenced color shaded relief maps. Improved simulation data storage: size of data files reduced buy a factor of four. Easily incorporate ocean currents in your simulations: create and use simple or more realistic currents that change with time and depth. Serial ports no longer required to run simulations. 3D finite element cable model improved and optimized for specific applications such as seismic, flexible pipes, and deployment of scientific and defense arrays. Over 100 cable bodies and joints can now be modeled simultaneously in the water column. Capability to model installations using top tension measurements and peel-off tension modes instead of cable length (roto measurements). Post processing capabilities: load navigation and cable engine data collected at-sea with third party software and fully model installation in the office to generate true, as-laid RPL. Tools to estimate surface slack can be used during transients (speed changes and cable transitions) going over irregular bottom to achieve a desired seabed slack. Screenshot of MakaiPlanPro 3D Viewer showing a simulated cable installation in progress. The orange lines represent the cable solutions, the green represents the ocean floor, the blue grid represents the ocean surface and the white line represents the ship path. The colors and display are customizable. Fast dynamic tools to compute optimum payout rates during any situation including transients and emergency situations. Backup, restore and merge data from different simulations. Enhanced 3D viewer with multiple new options and displays. Includes all new features from MakaiPlan 3.4. Your competition has it, shouldn’t you? Screenshot of MakaiPlanPro running a simulation. 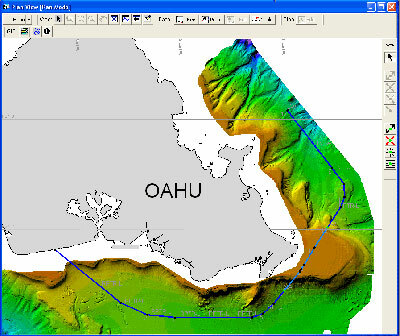 The left screen shows a top-down view of the ship path and desired cable route overlaid on top of a 3D shaded relief map of bathymetry. The lower left screen is a listing of the 3D model solutions displaying the precise outputs of the model. The right screen shows the same simulation from a profile (side) view. The lower right graph is a profile view graph of the ship, laid back cable and seafloor profile. The middle section of the screen shot shows status indicators of the vessels speed, direction and cable touchdown parameters.